Review of wetland delineations, permit applications, and exemption applications for WCA compliance. TEP notification, meeting coordination, and project recommendations. Development of wetland creation and restoration plans for City impact projects. 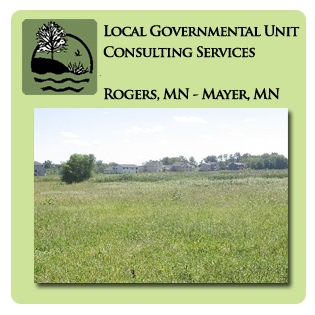 Kjolhaug Environmental Services Company, Inc. (KES) currently provides LGU services to cities in both Hennepin and Carver County. Included in these services are delineation reviews, wetland permit reviews, and exemption reviews. In all projects, this includes reviews for Wetland Conservation Act (WCA) compliance, and required application and decision notifications, TEP meeting coordination, and project recommendations. We work with City staff and engineers to coordinate our review with other related project reviews. TEP coordination includes organizing and leading meetings, preparing TEP findings, and securing TEP member concurrence. Information reviewed by the TEP includes both materials prepared by private consultants or by KES on behalf the city. KES recently completed and commenced a restoration plan for a 32-acre, partially drained and invasive dominated wetland within the City of Rogers. The restoration of this wetland will not only provide mitigation for wetland impacts within the City of Rogers, it will also increase flood storage volume and decrease peak stormwater flow through the City of Rogers while improving water quality. KES actively monitors wetland replacement areas in both the City of Rogers and the City of Mayer. KES also reviews monitoring reports submitted for developed projects for compliance with WCA permit approval for both cities. In both cases, KES makes and/or coordinates recommended management activities to facilitate successful replacement projects.